A little while ago Timbuk2 kindly offered me a chance to review their Command TSA-Friendly laptop messenger bag; I’ve been using it on my daily commute and found much to like about this great bag. The Command is a classic laptop messenger bag but with a TSA-Friendly twist. So just what is this TSA-Friendliness of which Timbuk2 speak, and perhaps more to the point why should we be TSA-Friendly when the TSA themselves are so unfriendly? The TSA-Friendliness is essentially it’s an extra zip which allows the laptop section to open out and lay flat, which means your laptop can go through airport scanners without having to be removed from the safety of you bag and placed in one of those crusty grey bins. I haven’t flown in the time I’ve used the Command, but anything that saves me removing my MacBook from the safety of it’s sleeve sounds good to me. 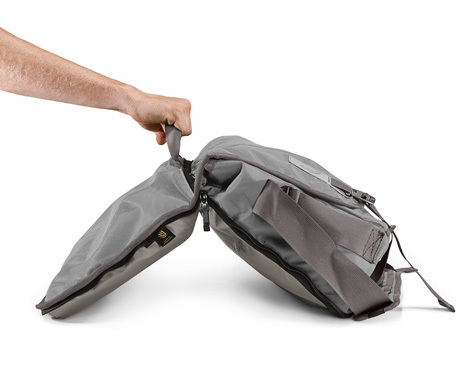 The laptop compartment is on the rear of the bag and is accessed by a single zip. Inside the laptop section is an integrated sleeve to hold an iPad. Opening the flap reveals the main compartment which is very large and can easily hold a jacket, headphones, books, files etc. At the front of the main compartment is a divider which creates a slim pocket at the front of the bag, perfect for a book or Kindle. There is a full size zipped pocket on the front of this panel and four pockets plus three pen slots on the rear. One thing this bag is not short of is pockets; I love having a pocket for different items I carry – there are so many on this bag that I sometimes forget what was in which pocket. Under the flap, on the front of the bag, are four more zipped pockets, including a ‘Napoleon’ pocket that can be accessed without opening the flap – very handy for keys and travel passes. On top of the bag is a really good grab handle, which is well padded and big enough for my large hands. One of the defining features of the Command is the use of metal hooks rather than the usual plastic clip buckles. They look great and add a degree of style to the Command although in use I found them a little fiddly and I would feel more secure with the usual plastic buckles. The straps for the buckles are also rather long, with my usual commuting load of laptop, headphones and a book there was about 6 inches of strap hanging beneath the bag. The Command also has optional velcro silencers which simply cover the velcro on the bag with colour co-ordinated nylon. They are a nice addition, but would be better still with the Rickshaw Bags style magnetic closures to keep the bag closed without needing the buckles. 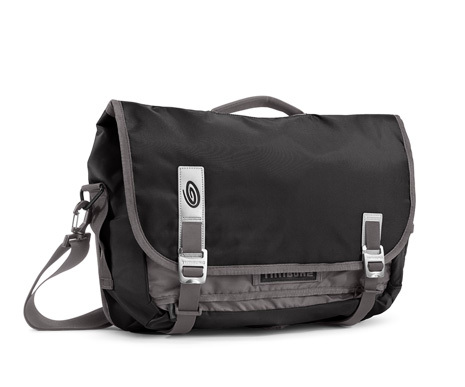 As always Timbuk2 have a range of great colour schemes, although I went for a rather corporate black and silver. Timbuk2 have a deserved reputation for producing well design and well made bags and the Command is another very well made and finished bag. However there were a couple of areas that I felt could be improved. For me the bag needs a stiffener across the top of the bag, underneath the grab handle, as even with a laptop in the bag it folds up on itself. Admittedly this was a 13″ laptop in a the medium bag which is really for 15″ laptops, and I also realise this is a personal preference, I can see that if you were using this in true messenger style on a bicycle you may want the bag to wrap around you more. The strap is great with an excellent quick release buckle, however the strap and buckle are rather heavy, which in turn makes the bag feel heavier than in actually is. I’m sure the strap will wear well, but it feels disproportionately heavy in comparison to the lighter bag. The padding in the laptop section is interesting being full of holes whack makes it lighter but appears to offer the same protection. I certainly had no qualms about carrying my MacBook and iPad in the Command. I always think you tell the quality of a bag from it’s zips. The Command uses high quality YKK zips which are smooth and quiet in use and have excellent pulls on them. It’s amazing how many bag manufacturers cut corners on what is a vital part of any bag. 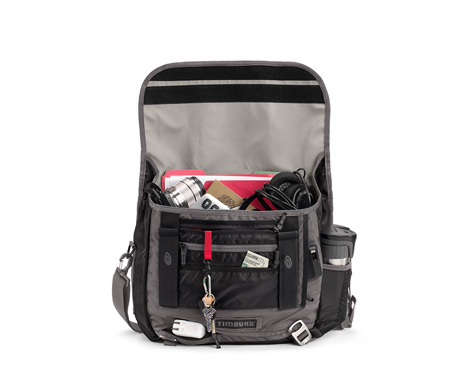 The Timbuk2 Command is a great laptop messenger bag, very well made and should last and last. The TSA-Friendly design should make airports that little bit easier, and the multitude of pockets and sections should mean you are never short of somewhere to put your gear, although finding it maybe another matter. I agree on the stiffener across the top. Did you notice the velcro on the edges under the top. I believe that you should be able to take an appropriately sized piece of wood or plastic (assuming metal would be a problem for the TSA) with velcro that matched, and put it in the velco in the bag, stiffening the top. If I get this working are you interested?